For those unfamiliar with the name (which derives from sean talamh, "the old ground"), Shantalla ia a five-piece band based in that hotbed of traditional music, fruit-flavoured beers and delicious chocolate, Belgium. 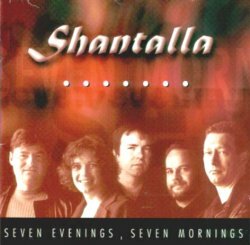 Now before anyone makes that old redundant joke about the dearth of famous Belgians (redundant because there've been plenty), Shantalla consists of four musicians from Ireland and a singer/bodhrán-player from East Kilbride in Scotland. However, Belgium has been there base for some years and this new album is the follow-up to their impressive self-titled debut. The four Irishmen in question are guitarist Joe Hennon from Dublin, Michael Horgan (uilleann pipes, flute and whistles) from Down, Kieran Fahy (fiddle and viola) from Galway and multi-instrumentalist Gerry Murray from Monaghan. The Scots flavour is provided by singer Helen Flaherty and reflected here in some of her song choices, notably The Fisherman's Wife, Glenogie, Erin go Bragh and John Anderson, though each maintains a very Irish accompaniment. It's this blend of the Scots and Irish, the match of Helen's superb, warm voice to the compelling music of the four men, which has established Shantalla as something more than a little bit special. There are echoes of Danú here and also occasional glimpses of Altan there (and Mairéad Ní Mhaonaigh has penned the introduction to the liner notes, helpfully translated into French and Flemish) but there's something quintessentially stirring about Shantalla's music that sets them apart. Like both the bands mentioned they make no concession to speed, no subtleties are lost and the temptation to be flashy is firmly resisted. Their tune choice is exemplary and the sheer breadth of their playing and, especially, the wonderful combination of flute and fiddle, is expressed most resoundingly in the closing set of reels The Journey by Train/Richard Dwyer's/The Ivy Leaf/Vincent Blin's No. 1. That combination says it all: the first tune composed by the Leitrim fiddler Joe Liddy; the second ascribed to the Cork accordionist and brother of Finbarr Dwyer; the third thought by many to be one of the best tunes in the Irish repertoire; and the last…. errmm, just who is Vincent Blin? As an additional bonus, the 28-page liner booklet contains lyrics and details of all the tunes (with again French and Flemish translations of all but the lyrics) plus a number of superb photographs. A small independent label such as Wild Boar should be heartily congratulated for its presentation skills! Shantalla's last album was taken up by Green Linnet for worldwide distribution and this one richly deserves similar action. If it's not available in your local store head for the band's site www.shantalla.com. Reviewed by Geoff Wallis for Musical Traditions magazine – www.mustrad.org.uk.